“Amazing!” When your dinner guests say that, well… that is music to any cook’s ear. Wouldn’t you love to hear that word every time you cook? Learn how to easily make Cuban food at home, just like a pro, or a Cuban mom. Learn the secrets of “sofrito” - your secret to making tasty, authentic, Cuban cuisine. Amaze your friends with Cuban Tamales - not your typical cornmeal dough filled with meat. Unlike the more common Mexican tamales, these are made with fresh corn and no flour. They are also boiled and not steamed. Saute the onions, peppers, garlic and seasonings in oil. Add meat and tomato sauce and simmer. Pour the corn into a bowl and fold in meat and vegetable mixture. Fold the corn husks into a pocket shape, with a square closure at one end. It should look like a pocket with one end open. Fill the folded corn husks and fold the other pocket over. Wrap with string to hold together, or, like in Cuba, use a cornhusk strip. I find string easier. Cook for about 25 minutes in boiling water. Congrís – (Moros y Cristianos) — Made with last nights rice and beans. It is a staple in a Cuban household. Cuban Pasta — This is a Cuban twist on this famous comfort food. 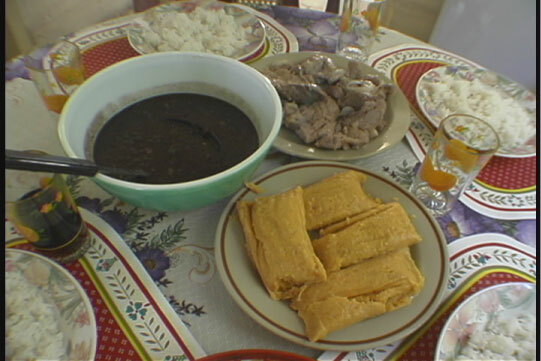 Cuban Tamales — Unlike the more common Mexican tamales, these are made with fresh corn and no corn flour (masa). Fried Pork Steaks — The lime juice really adds a freshness to the pork and makes them excellent for a hot, humid summer night in Havana. Luisa's Baked Chicken — Marinated in Orange juice, this chicken is very tender and tastes even better the next day. Malanga with Onion Sauce — This recipe can be used for all starchy root vegetables like Yuca and Ñame. Okra Salad — Here is another very refreshing salad for a hot Cuban night. Roast Pork — An excellent way to make cheaper cuts of Pork tasty. Black Beans — This is but one way of making the classic; Cuban black beans.